Dr Ocita, in an e-mail circulated on the staff mailing list on Thursday, accused, Prof Nawangwe allegedly made statements that were concealed referenced to Dr Ocita accusing him of recruiting his wife on a PhD programme. “Some university officials when left in office in acting capacity decided to recruit their wives and are now the ones who are suing the University,” the VC was quoted as saying in Dr. Ocita’s circulated e-mail. Dr Ocita is a husband to one Judith Ikiring Obore, a PhD student who dragged Makerere and Prof. Muhamood Mamdani, the Makerere Institute of Social Research (Misr) to High Court over malice and victimisation of students and abuse of academic procedures, negligence of duty, and breach of contract among others. Dr Ocita in an email said he was aggrieved by the statements made by the VC saying he should not be held liable for his wife’s actions. “It was absolutely unnecessary for a respectable Chair of Senate to bring up my name in the deliberations before Senate when there was no single case on or about me personally,” he said. “Please, show that you are different from the leadership of MISR and that you can differentiate between my wife (who has independently sued the University) and myself. In the same way that my wife should not be victimized for my actions, I too should not be held liable for the actions of my wife, which I fully support,” he added. Ms Ikiring was admitted on March 13, 2014, as a graduate student at Makerere University. Her admission followed an award of scholarship by MISR under which she was to pursue a five-year Master of Philosophy/Doctor of Philosophy in Social Studies from January 2014 to January 2019. The scholarship award letter states that continuation of funding required her to be “in good academic standing.” In her suit before the High Court Civil Division, Ms Ikiring, through her lawyers Kobs Advocates and Solicitors, claims that MISR manipulated the stipulated requirements for ‘good academic standing’ to target particular students and avert a financial shortfall arising from the expiration of several grants which left 16 MISR students without funding for 2017. She alleges in the plaint that in planning for the 2017 academic year, Misr sought how to cut the 16 slots across four cohorts to avert the looming financial crisis. MISR identified the 2014 cohorts to which she belonged as the one from which the highest number of scholarships could be conveniently terminated. “As a result, the examination process which involves compiling two sets of annotated bibliographies, setting two sets of research questions and subsequently writing two comprehensive examinations was manipulated to predetermine who would progress to the fourth year, that is to the PhD stage, and who would lose their scholarship,” Ikiring maintains in her plaint. She adds that Prof Mamdani and Dr Lynn Ossome, the chairperson of her reading committee, who is also a respondent in the case, were advised that it would be illegal to terminate any students’ scholarship midway provided the student had complied with the conditions of the scholarship and maintained “good academic standing”. Ms Ikiring adds that contrary to existing requirements, practices and university regulations, the writing of a PhD research proposal was also arbitrarily added to the third year examination requirements and for the first time, a deadline by which the said research proposal should be submitted was set to coincide with the end of the 2016 academic year. She says this was unprecedented and did not go through the right university procedures to make it binding. Ms Ikiring contends further that the manipulation of academic procedures involved redefining good academic standing, well into the examination process and revising previous practices to predetermine students’ results. In his response to the suit filed through his lawyers of M/s Tumusiime, Kabega & Co Advocates on May 3, 2018, Prof Mamdani denies all the charges leveled against him, arguing that at the commencement of the trial he will seek to raise preliminary objections to the effect that Ms Ikiring’s suit is bad in law and, therefore, should be struck out. He explains that Ms Ikiring did not fully comply with the rules and regulations governing the scholarship awarded to her by MISR. He says she failed to submit her doctoral research proposal to the MISR Academic Board before the set deadline of August 31, 2016, and instead submitted it on September 8, 2016, contrary to the set guidelines. Prof Mamdani adds that Ms Ikiring’s doctoral research proposal was rejected by the Misr Academic Board because it lacked “a problem statement” as required by the regulations. “Therefore, the plaintiff could not be permitted to progress to the PhD segment without a valid research proposal,” Prof Mamdani says. Dr Ocita denied the accusations that he plaid any part whatsoever in his wife’s admission on the PhD programme. “In fact, I was in South Africa at the time and not even part of the Makerere University establishment,” Dr Ocita said. He said that he joined MISR in January 2015, when his wife was already a student there, having been admitted (not recruited) in 2013 for a programme that began in January 2014. According to Dr Ocita, it had become clear to the affected students that the University’s internal dispute resolution structures could not grant them justice. “Before resorting to the courts of law, the students had patiently been trying to seek an amicable solution for twenty months in one case, and for twenty-five months in the other. The plenteous documents, minutes of proceeding and correspondences on these cases show how officials at various levels, either through negligence, collusion, manipulation, or cover-ups left the affected students without any hope for an amicable solution,” Ocita explained. He faulted the University officials for circumventing justice and subjected the cases to numerous procedures and deliberations in disregard for sub judice rule. 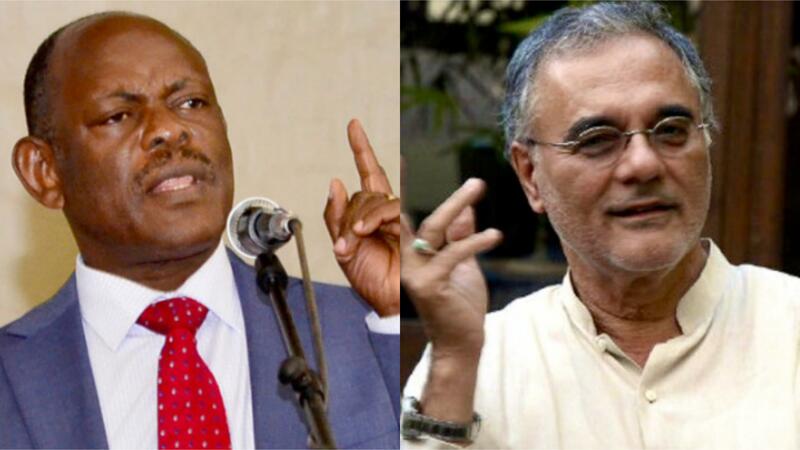 Dr Ocita also accuses Prof Nawangwe of conniving with perpetrators at MISR saying that the University allows one of the parties in the dispute (in this case MISR represented by Prof. Mamdani and Dr Lyn Ossome) to be part of and therefore guide deliberations in which they have unconcealed interests. “When has a monkey ever been fair in adjudicating on the fate of the forest? There is something called “conflict of interest” which has repeatedly been ignored in these deliberations, including the processes at CHUSS. Then there is also the ignoring of the sub judice rule and subjecting a case that is before High Court to deliberations of this nature,” he added. He added that despite several infractions against established rules been reported to the VC, instead seemed more committed to bending rules and penalising victims while protecting the perpetrators in MISR. “If your office cannot fairly enforce such compliance without fear or favour, which office below you will work miracles and ensure that justice is served? Which student is so stupid to believe that after trying in vain to seek redress from the University’s internal structures, their interest can be best served by them withdrawing the case from an impartial court of law, given the circulating correspondences, minutes of proceedings, and the kind of partial statements that a whole Vice Chancellor can callously make before the University Senate,” he said.